Raise your hand if you go to bed excited to wake up and eat leftovers for breakfast. (My hand’s up, and I really hope I’m not the only one.) Or, better yet, you forget about them, wake up starving, open the fridge, and the refrigerator light illuminates your leftovers like some kind of divine answer to your morning hunger. It’s enough to bring a tear to my eye. I won’t pretend that I haven’t ever taken a cold slice of pizza straight from the fridge and eaten it in the AM, but isn’t it even better when you can breakfast-ify what you have waiting in the fridge from the night before? Like, say, by nestling it in between a breakfast taco shell made of crispy cheese and perfectly cooked egg? Oh yes. 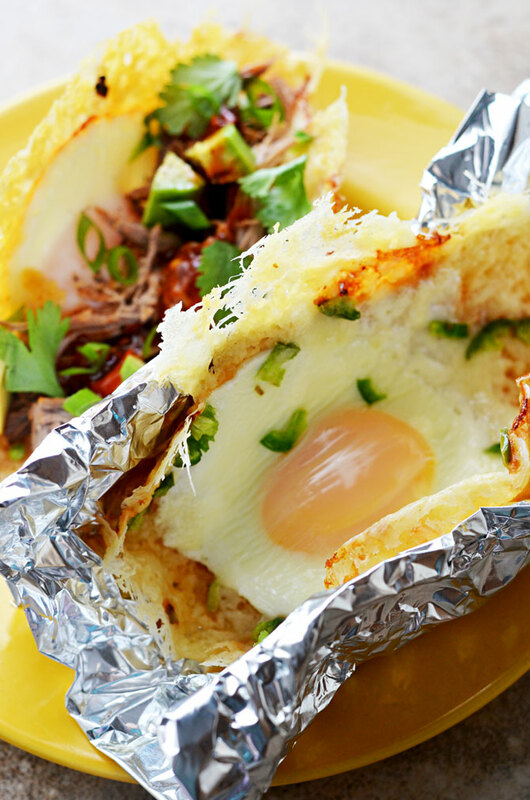 Meet the Frico Egg Breakfast Taco. Browsing Instagram in bed one night (as I’m wont to do when I can’t fall asleep– mostly because I have my phone on in the first place), I came across a picture of pure genius by @julesfood. It was a taco, but not just any taco. 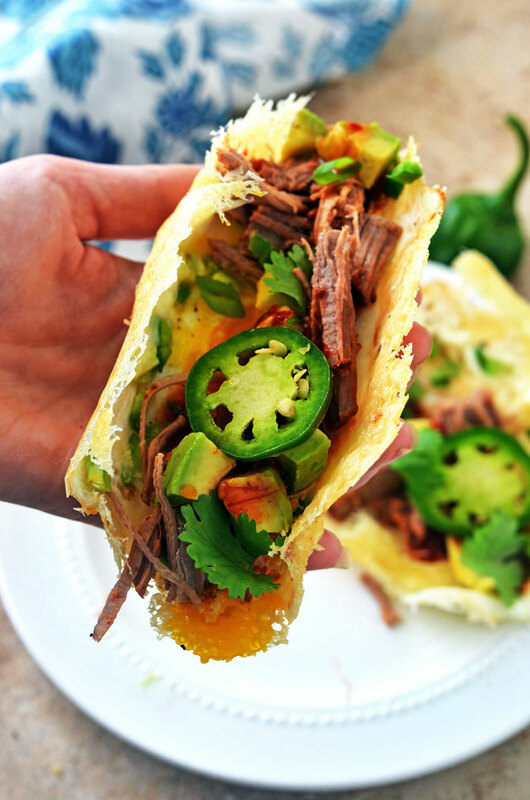 A cheesy, eggy, breakfast twist on tacos that I became instantly smitten with. I thought about it at work. I dreamt about it. I breathed this taco. And after basically becoming one with this taco, I finally made it. And it was every bit as glorious as I had imagined, and then some. If you’re the type of person whose favorite part of making grilled cheese is eating the crispy parts that ooze out onto the pan, then this my friend, is for you. You take some cheese and scatter it on a pan. Heat it until it’s melted together and beginning to turn slightly golden. 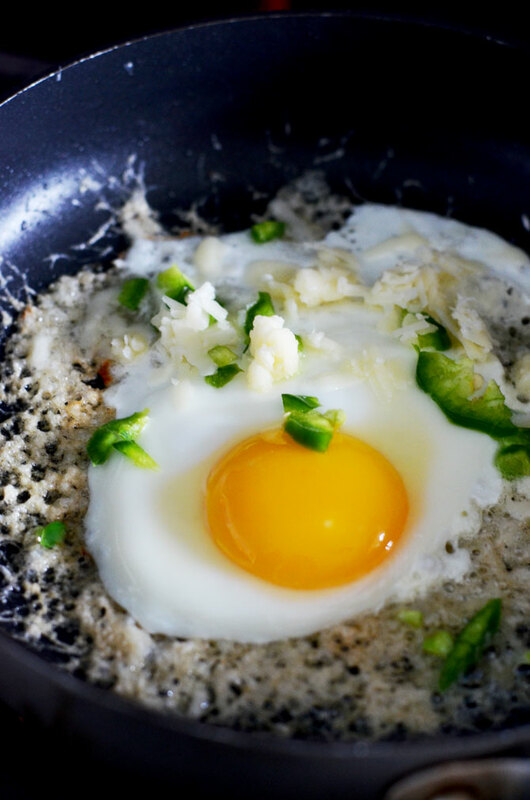 Crack an egg on top of the cheese and, if you’d like, sprinkle a little more cheese and some chopped jalapeno over it. Cook until the whites are set, and transfer the whole thing to a U-shaped sheet of aluminum foil, to set. 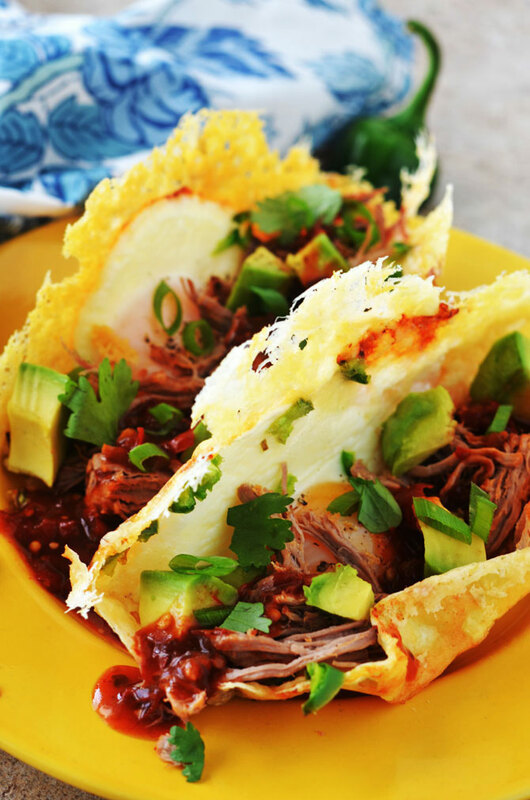 Voila, you’ve got a Frico Egg Taco Shell. 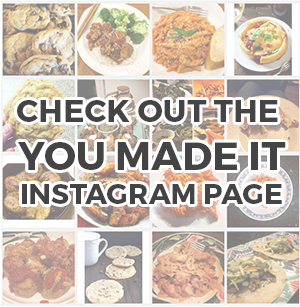 Then you’re free to fill it with whatever you have laying around in the fridge– I used leftover meat from my Slow Cooker Honey Chipotle Stout Enchiladas, but you could use chicken, vegetables, pork, steak… pretty much anything you have laying around. You could even cook up some breakfast sausage to throw in there if you don’t have any leftovers longing to be used up. Try it out for yourself, and make sure to take a photo and tag #hostthetoast on Instagram or Twitter so you can inspire other people to give it a go! Take a sheet of heavy duty aluminum foil and fold over. Shape into a U to use as a mold for the shells. 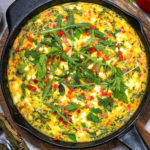 In a small nonstick skillet over medium heat, sprinkle 3 tablespoons of cheese in a circle. Be sure to sprinkle in a thin, even layer, as piling the cheese up too much will prevent it from crisping properly. When the cheese melts and just begins to turn light golden around the edges, crack an egg over top. Try to keep the yolk intact and at the center of the circle. Sprinkle with a tablespoon more of cheese, and a bit of chopped jalapeno, if desired. Cover with a lid and cook until the whites have set, about 2-3 minutes, or to your desired doneness. Season with salt and pepper. Using a spatula, carefully transfer the frico egg to the U-shaped foil. Slide the egg inside of the foil to mold. After a few minutes, remove the egg from the mold and plate. Repeat until all of the egg shells have been created. Fill the shells with leftovers or filling of choice, and top with diced avocado, remaining jalapeno, salsa, and cilantro. Serve warm. BRILLIANT. This looks so delicious. This is so interesting! 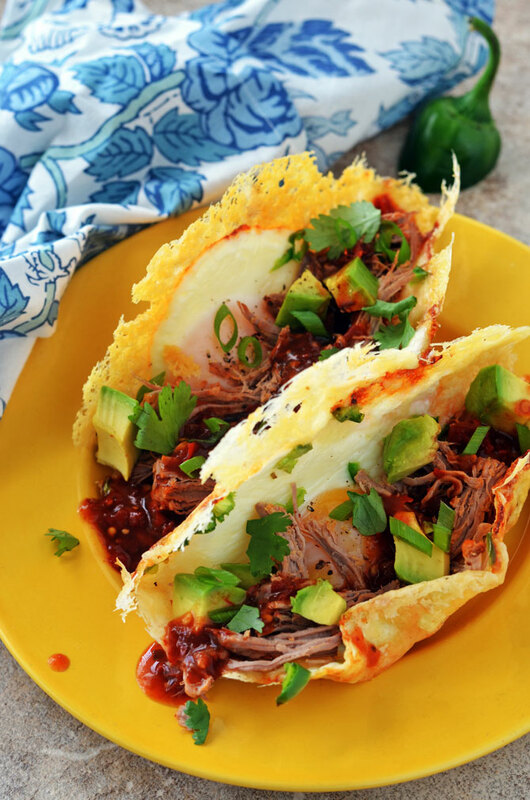 I have never thought or heard of melting cheese and frying an egg as a taco shell – so innovative! Love the breakfast twist on tacos – because anytime is a good time to be eating tacos, let’s be honest! How did you prevent the cheese going soft? Even Kenji from seriouseats had this problem. I believe the egg cooked on top/in the center has a lot to do with it. In Kenji’s version, it’s just a shell made of cheese, whereas this has the barrier of the sunny side up egg between the frico cheese and the toppings, so the moisture from fillings would not be sitting directly on the crisped cheese. I have never tried it without the egg though to compare, so that’s just a guess! This looks great! How do you keep the cheese from going limp? Sorry if my English is no good. If you do a thin enough layer of cheese and you cook it long enough, it gets crispy like a cracker. 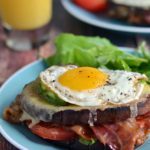 The egg cooked in the center helps to support any of the fillings that rest on top instead of letting them overly saturate the cheese! 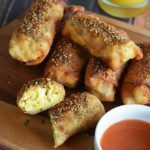 We made these the other morning for brunch with some left over Asian-style sticky ribs and they were awesome! 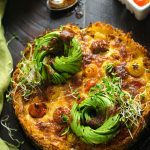 Thanks for posting this recipe, we will be making these again and again!